There is Hope, developed by NextLOGiK, provides a mobile platform to increase education about suicide, diminish common myths associated with suicide, and guide individuals through the encouraged steps to take to prevent suicide or minimize the harm associated with suicidal ideation and potential attempts. Serving as a new resource for community members to access additional education or support concerning suicide prevention and intervention, There is Hope enhances the use of Grassroot’s 24-hour American Association of Suicidology accredited hotlines. By taking users through a series of questions, the application advises individuals on actions they can take to minimize a potential crisis and get help. There is Hope is available now in the Apple App Store and Google Play Store. After the success of launching There is Hope, we soon realized this could be a valuable resource to not only Howard County, but the entire United States. We worked closely with the state of Maryland to release version 1.1 of There is Hope that now includes the Maryland Crisis Hotline (1-800-422-0009) and the National Suicide Prevention Lifeline (1-800-273-8255). 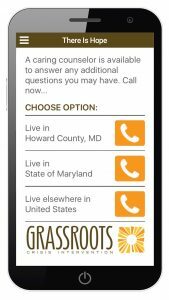 Upon completion of the self-assessment, users can then select to connect to the Howard County hotline, Maryland lifeline or the National lifeline. If users select the National Suicide Prevention Lifeline, their location is used to route them to the closest available suicide prevention hotline. Interested in a Similar App? 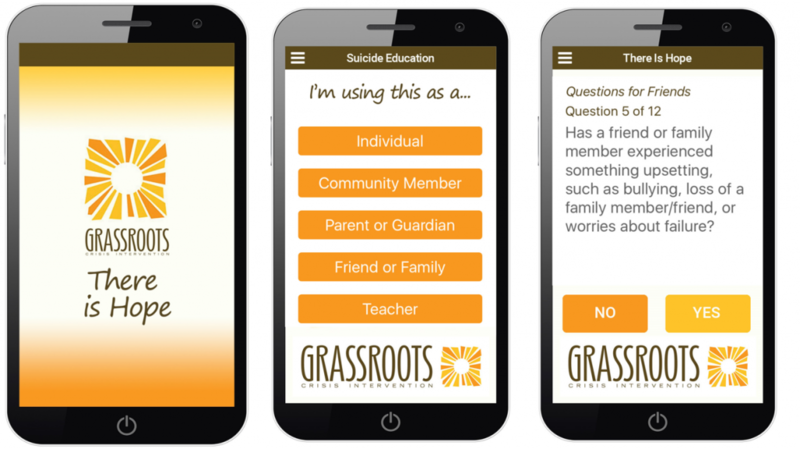 Learn more about our customizable options for a self assessment suicide prevention app.